What are the different types of ANCA vasculitis? What does it affect, and what are the symptoms? How can we test for ANCA Vasculitis? How is ANCA vasculitis treated? What should I do if I have vasculitis? ANCA vasculitis is a type of autoimmune disease that causes vasculitis. ANCA stands for Anti-Neutrophilic Cytoplasmic Autoantibody. All of these terms will be explained here, including how the disease works and what we can do for it. You may hear different names or terms for this disease, including ANCA vasculitis, ANCA disease, ANCA-associated vasculitis. Other names include small vessel vasculitis or pauci-immune vasculitis. Vasculitisis swelling or inflammation of blood vessels (“-itis” = swelling or inflammation and “vascular” = blood vessels). Blood vessels in the body carry blood from the heart to all the different organs/tissues, and then back again. Arteries, veins, and capillaries are different kinds of blood vessels. Blood vessels are different sizes depending on where they are in the body- as they get further away from the heart they branch and get smaller. 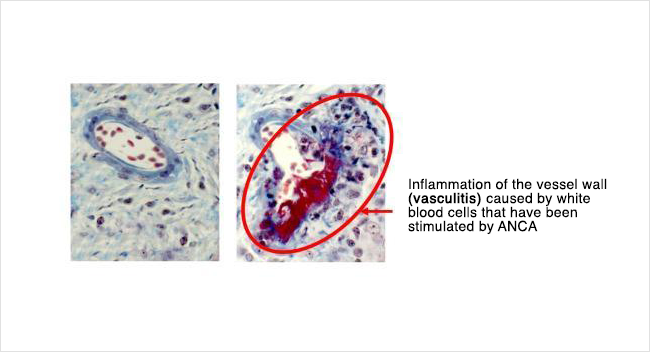 The inflammation in vasculitis is caused by white blood cells attacking blood vessels. White blood cells are cells in the body that are part of the immune system. As part of the immune system, they can help fight infection and can cause inflammation. Many different things can cause vasculitis, including infection and autoimmune diseases. Here we will talk about autoimmune causes since ANCA vasculitis is a type of autoimmune vasculitis. The immune system’s job is to defend the body from infections or germs. White blood cells are a major part of the immune system. It can be helpful to think of them as the soldiers of the immune system. When the immune system recognizes something foreign (like germs that cause infection), white blood cells attach to and attack the invaders. White blood cells cause swelling and inflammation as they try to kill the invaders. Autoimmune disease is what happens when the body’s immune system attacks the body itself, rather than attacking an infection or foreign invader. “Auto” = self, so autoimmune means the immune system is attacking the body itself. There are many different kinds of autoimmune diseases. Depending on what kind of cell or part of the body the immune system attacks, different problems and symptoms can occur. Some examples of autoimmune disease include lupus, Crohn’s disease, and rheumatoid arthritis. The immune system makes antibodies to help prevent or fight infection. Antibodies recognize and attach to something (like bacteria or germs) to help the immune system find it and attack it- sort of like marking or tagging it. Normally antibodies are made which recognize germs and invaders (things foreign to the body). However, sometimes the body can make antibodies that recognize and attach to someone’s own cells or tissues. These are called autoantibodies (auto = self, so autoantibody = antibody to something in oneself). Different kind of autoantibodies are involved in different autoimmune diseases. Since autoantibodies can recognize or target different things, how an autoimmune disease works and what symptoms it causes depend on what the autoantibody targets. When ANCAs (the autoantibodies) attach to neutrophils, it makes the neutrophils attack small blood vessels in the body. This is how vasculitis (inflammation in blood vessels) happens in this disease. ANCAs cause neutrophils (a type of white blood cell) to attack small blood vessels, and the blood vessels become swollen and inflamed. Most people do not have these ANCAs (autoantibodies that attack small blood vessels). ANCA vasculitis can cause different symptoms depending on what organ or part of the body that is involved. For example, when blood vessels in the skin are affected, it can cause a rash. When blood vessels in the kidney are affected, it can cause blood and protein to leak into the urine, as well as kidney damage (kidney function gets worse). Many of the different symptoms that can be caused when different body parts are involved are listed later. Not all small blood vessels in the body get attacked. We don’t yet know why some organs/parts are affected in some people with ANCA vasculitis and different ones are affected in other people. Below is an illustration of a piece cut from a small blood vessel. 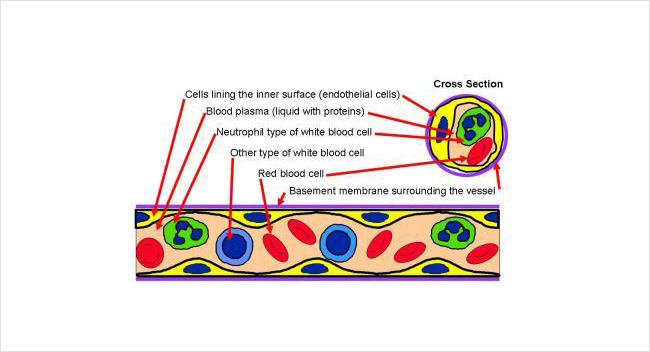 The blood vessel contains blood that is made of red cells and white cells floating in a liquid called plasma. The inside surface of the vessel is lined by cells that sit on a thin casing. 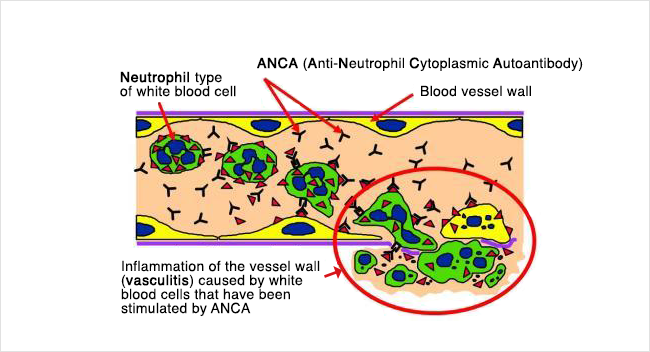 ANCA vasculitis is caused when ANCAs attack neutrophils. This causes the white blood cells to attack vessel walls, which creates swelling. Shown below on the left is how a normal small vessel would look under the microscope. On the right is how the vessel looked after it was injured by ANCA vasculitis. Compare this to the earlier illustration to understand what has happened. There are 2 main kinds of autoantibodies that can be involved in ANCA vasculitis. One is called P-ANCA (perinuclear ANCA). This P-ANCA type of autoantibody usually targets and attaches to something called MPO (myeloperoxidase), which is inside of neutrophils. The other one is called C-ANCA (cytoplasmic ANCA). 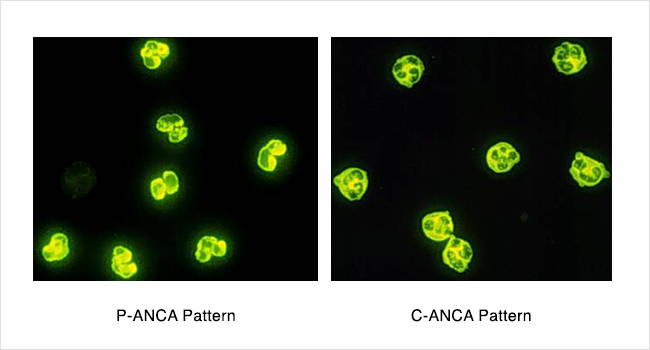 This C-ANCA (a different autoantibody) usually targets and attaches to something called proteinase 3 (PR3), which is also inside of neutrophils. There are blood tests to detect these autoantibodies (P-ANCA or C-ANCA) in the bloodstream. A small percentage of people will not test positive for either the C-ANCA or P-ANCA type. We often call this “ANCA-negative” autoimmune vasculitis to mean that your disease looks and happens the same way but the ANCA blood test is negative. Knowing what kind of ANCA you have (MPO vs PR3) can be helpful for your doctor. However, without doing the blood test, it is impossible to know from symptoms alone which type you have. As mentioned above, ANCA vasculitis can attack different organs or parts of the body. Because of this, it can cause symptoms. Also, when we look at a biopsy (a small piece of tissue, such as kidney, skin, or lung to look at under the microscope), it can look different in different people. Listed below are some different types of ANCA vasculitis. However, we are learning that it may be more helpful to know what type of autoantibody you have (MPO vs PR3) than to know what type of disease (listed below) you have. 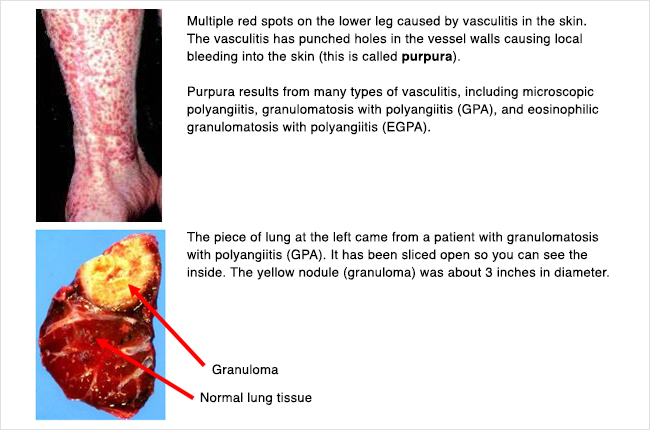 Granulomatosis with polyangiitis (GPA, previously called Wegener’s): ANCA antibodies cause inflammation and swelling in small blood vessels. Under the microscope, we see a certain kind of inflammation called “granulomatous inflammation.” This type of ANCA vasculitis often affects the lungs and/or sinuses. Eosinophilic granulomatosis with polyangiitis (EGPA, previously called Churg-Strauss): This type is similar to granulomatosis with polyangiitis (GPA, above)- we see granulomatous inflammation under the microscope, and the lungs and/or sinuses are often affected. However, we see 2 other things with this type (EGPA). People have asthma, which can be hard to control. On blood tests, there are higher levels of a certain kind of white blood cell called eosinophils. As mentioned above, ANCA vasculitis happens when autoantibodies (ANCAs) attack small blood vessels. When ANCA vasculitis involves the kidneys, it affects the filters in the kidney. The filters of the kidney are called glomeruli (a single one is called a glomerulus). The glomeruli are made of a bundle or ball of tiny blood vessels called capillaries. Since ANCA antibodies affect small blood vessels, these small blood vessels in the glomeruli (filters) can be attacked and damaged. 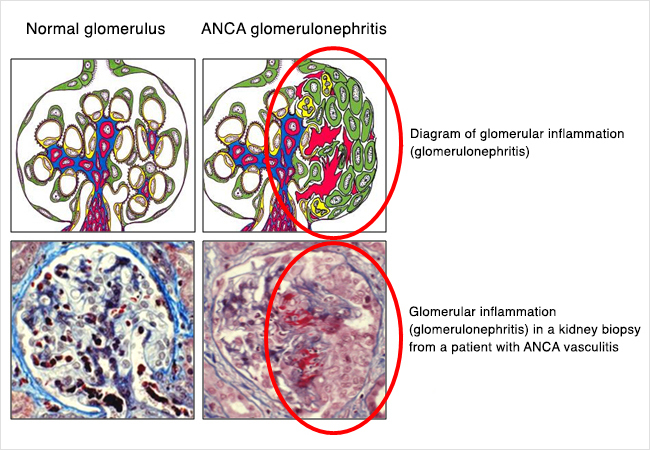 ANCA glomerulonephritis is the term we use when ANCA vasculitis has affected or involved the kidneys, and when this happens there is inflammation and swelling in the kidney filters (“glomerulo-” = filters of the kidney, “nephr-” = kidney, “-itis” = inflammation or swelling). The glomeruli, or kidney filters, normally filter water, electrolytes, and waste/toxins from the blood into the urine. There are proteins and red blood cells in the bloodstream that normally do not go through the filter, so do not normally get into the urine. When there is inflammation and swelling in the glomerulus (filter), like when white blood cells attack them in ANCA vasculitis, they don’t work properly, and red blood cells and protein can leak into the urine. Sometimes blood can be seen in the urine, making it look brown like tea or Coke, but sometimes it can only be seen on a test called a urine dipstick (or urinalysis), or under a microscope. Protein in the urine can also be detected on urine dipstick, and can sometimes make the urine look foamy or bubbly. The inflammation in the kidneys from the antibodies (ANCAs) attacking the glomeruli (filters) also causes the kidney function to get worse, which means that the kidneys are not able to clean the blood by getting rid of toxins/waste, fluid, and electrolytes in the urine. This can lead to kidney failure. Depending on how much the kidney function is affected, this may or may not cause symptoms. There are usually not a lot of symptoms from decreased kidney function until the kidneys are almost failing. Checking bloodwork can help your doctor know if your kidney function is low before you have symptoms. If the kidneys fail, and cannot do their job anymore, you may need dialysis. Dialysis can be temporary in some people. If the kidney function gets better after treating the inflammation, some people can come off of dialysis. Sometimes ANCA vasculitis can affect kidney function slowly- over weeks, months, or even years- but in many people, it can happen very quickly, in days. The inflammation leads to scarring, or permanent damage to the kidney. Treatment can decrease the inflammation and swelling. This is why it is usually important to treat ANCA glomerulonephritis (kidney disease from ANCA vasculitis) quickly, to try to prevent or decrease the amount of damage and scarring in the kidney. We will talk more about treatment later. ANCA vasculitis is rare. It is diagnosed most commonly in people in late middle age (50s and 60s), but can happen in older or younger people. Is is uncommon in children. It is equally common in men and women, and is much more common in whites than in other races. To check for lung involvement- X-rays and/or CT scans of the chest. Further testing can include bronchoscopy, which is looking into the airways/lungs with a camera. Biopsy of an affected tissue or organ- this means a procedure to get a small piece of tissue (for example, kidney, lung, sinus, or skin) from a body part to look at under the microscope. The procedure is different depending on the type of biopsy (where the biopsy is coming from). Although a positive ANCA test (on bloodwork) can be very helpful in pointing to a diagnosis of ANCA vasculitis, it is not a perfect test and cannot determine the diagnosis alone. An ANCA test can sometimes be positive in other diseases (in people who don’t have ANCA vasculitis). Also, about 10-20% of people with pauci-immune small vessel vasculitis have a negative ANCA test. Therefore, evaluating the symptoms or involvement that someone has is very important, and getting a biopsy can be important in many cases. If kidney involvement is suspected, a kidney biopsy can confirm the diagnosis. Treatment of ANCA vasculitis is complicated and should include specialists for the organs/body parts involved. When the autoantibodies (ANCAs) attack different parts of the body, they can damage those areas. The inflammation in blood vessels can lead to scarring, especially if it goes on for a longer time. Because the immune system (antibodies and white blood cells) is causing the inflammation and damage, treatment involves trying to suppress or quiet the immune system. Medicines that do this are often called immunosuppressivemedicines. There are different types of medicines that suppress the immune system, and they work in different ways. However, since the immune system is responsible for preventing or fighting infection, all of these medicines can increase someone’s risk of getting infections. These medicines may have other side effects or risks that are unique, but all of them can put you at a higher risk of infection. In general, treatment for ANCA vasculitis involves 2 parts. The first part is called induction therapy, which is aimed at trying to get the disease controlled and into remission. Once the disease goes into remission, the second part of treatment is called maintenance therapy. Maintenance therapy involves continuing immunosuppressive medications to keep the disease in remission and decrease the chance that it will come back (relapse). Corticosteroids– these are sometimes called “glucocorticoids” or “steroids” as well. These can be given by IV or by mouth (as a pill). Some people get a few IV doses then switch to a pill form. Common types include prednisone (pill) and methylprednisolone (Medrol, Solumedrol – IV). Steroids are often started first but are much less effective on their own. They are usually given with one of the other medications listed below. Steroids are often given as a “taper” over time- with a decreasing dose over several months. There are a number of side effects that can be seen with corticosteroids. Some of these happen soon after you start taking them- including trouble sleeping, increased appetite, mood changes or irritability. Some of these are not a problem for people taking corticosteroids for a short time but can be a risk if people are on steroids for a long time- such as effects on bone health. Cyclophosphamide (Cytoxan)-this is a medication that can be given as a monthly infusion or as a daily pill (by mouth). This is generally given for anywhere from 3 to 6 months – as induction therapy (see above) to get the disease into remission. This is the treatment that has been used the longest for ANCA vasculitis (besides steroids) and it is effective in making the disease go into remission in the majority of people. It is a type of chemotherapy (though is given at lower doses than are used for cancer) and has side effects including nausea and hair thinning/loss. Long term risks/possible side effects include infertility and cancer (much less common) – these are related to the total dose someone receives and these risks (especially for cancer) are low when this is given for a short period (6 months or less). Monthly IV treatment (compared with a daily by mouth dose) cuts the total amount of cyclosphosphamide received by about half. Rituximab (Rituxan)– this is givenas an infusion. The initial treatments (induction therapy) are given either as 4 weekly doses or 2 doses spaced 2 weeks apart. The effects last about 6 months in the body. It can also be used for maintenance therapy, and maintenance (repeat) doses are generally given after 6 months. Rituximab is an antibody that targets the cells of the body’s immune system that make antibodies (to prevent the body from making more ANCA autoantibodies). Azathioprine (Imuran)– this is a pill that is taken daily by mouth. It is generally used for maintenance therapy (after treatment with cyclophosphamide or possibly rituximab). Mycophenolate mofetil (CellCept or Myfortic)– this is a pill that is taken by mouth twice a day. It is used less commonly in ANCA vasculitis but is an alternative treatment if other medications are not an option or do not work. Plasmapheresis – this is a procedure that removes antibodies from the bloodstream – including the ANCA autoantibodies that cause this disease. It can also be called plasma exchange or PLEX. A person’s blood is run through a machine that removes antibodies from the blood, then the blood is returned to the body (without the antibodies). Treatments last a couple hours and are usually done every 1-2 days for about 2 weeks. This is done early (as part of induction therapy) if someone has bleeding in the lungs or often if they have severe kidney injury/damage. This is used in addition to some of the medications listed above. What stage is my disease? What are the risks and side effects of treatment? Will I have to change my normal activities? In some patients, even with treatment, involvement of the kidney with ANCA vasculitis will lead to kidney failure. Fortunately, kidney transplant is a treatment option for these patients. Visit this page in the Kidney Health Library for general information about kidney transplant. Will the ANCA disease come back in my kidney transplant? About 10-15% of patients will have symptoms of ANCA disease after a kidney transplant. This is called recurrent disease. Not all recurrent symptoms involve the kidney, but some will. It is important that ANCA disease be controlled and in remission (usually for at least a year) prior to getting a kidney transplant. This reduces the chance that the ANCA disease will come back after the transplant. Generally, if ANCA disease recurs in a transplanted kidney, it will occur between 2.5 and 4 years after transplant, but it can occur at any time. Is there any treatment for ANCA disease that comes back in a transplant? Treatments are similar to those for patients with ANCA disease in their original kidneys. These are different from the ones taken to prevent kidney transplant rejection. If the ANCA disease comes back, will it cause me to lose my kidney transplant? It is uncommon for recurrent ANCA disease to cause a transplanted kidney to fail. If you look at all patients with ANCA disease 10 years after their transplant, about 8% of them will have lost their kidney due to recurrent ANCA disease. A patient with ANCA disease who gets a kidney transplant can expect a similar life span and kidney transplant survival as a transplant patient who has kidney failure from another disease. The Vasculitis Foundation was created to help the isolation that vasculitis patients and their families experience. They provide support, awareness, and research for all types of vasculitis. ClinicalTrials.gov provides regularly updated information about federally and privately supported clinical research. It includes information about a trial’s purpose, who may participate, locations, and phone numbers for more details. CenterWatch Clinical Trials Listing Service: this site gives general information about clinical trials. It includes listings of thousands of industry-sponsored clinical trials that are actively looking for patients in the U.S. and internationally. These podcast episodes were produced by the UNC Kidney Center and are hosted by Dr. Ron Falk. ANCA Vasculitis – Dr. Falk speaks at a patient support meeting of the Vasculitis Foundation, and answers common questions he hears from patients. This podcast is available in English, Spanish and Chinese. ANCA Vasculitis Pathology – This video features J. Charles Jennette, MD and patient Dianne, and they discuss what ANCA vasculitis is, what causes it, and what it looks like in a biopsy. ANCA Vasculitis Treatments – Dr. Falk and patient Dianne discuss common concerns and questions about treatments for ANCA vasculitis. Being There for Your Friend with Vasculitis – When someone has a friend or family member who has been diagnosed with vasculitis, that person might not know what to say or what to do. Delesha Miller Carpenter, PhD, MSPH interview Dr. Falk and patient Dianne in this two-part episode. Living a Full Life with ANCA Vasculitis – Dr. Falk and patient Dianne discuss ways that an ANCA patient can improve the quality of his or her life.